Not to start a fight , But I can tell you from my personal experience that what you said about windmills is total BS. I have worked on the ground under about 50 working windmills. I never saw a dead bird or bat or any sings of their remains. AND yes I was looking for them. You will find more dead birds along one mile of road way, should we limit car to 10 MPH or go back to horse and buggy? As to the noise, standing directly under the blade tips I could here a whoosh as each tip passed over head. The volume of that sound was less than if you were standing 30 feet from the average idling car. At 100yards I could not here them. Again total BS. A windmill captures 25 to 30% of the wind energy that passes through the blade diameter, any thing more and the blades will start to stall due to excessive drag on the blades. Also the closest mills I worked on were close to 1/2 mile apart. So plenty of room for the wind to blow through and around them. Sorry if this bothers anybody. I just have a problem with misconceptions, half truths and out-rite lies being passed along as truth. 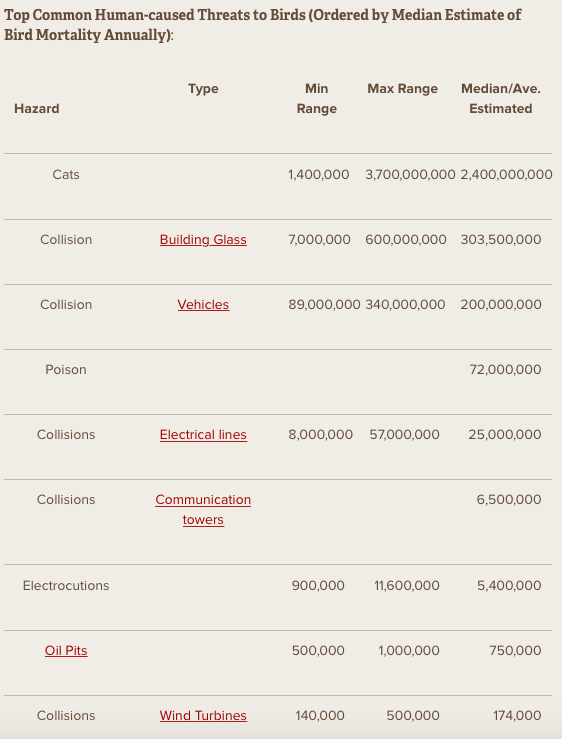 The estimates are all over the place, but the biggest human-related bird death number is from collisions with buildings. A big solar farm was built on farm land in Monticello MN last year. As much as I like seeing more solar, it is better to put it in a dual use situation such as on residential/commercial roof tops, parking lot covers, etc or in locations that would otherwise go unused such as the highway median shown in the video in this thread. For the solar farm in Monticello I guess someone could argue that eventually the farm land would have eventually been taken over by houses, at least the future opportunity for dual use would exist. A small solar farm was built next to the offices of my electric company. They had it landscaped with native plants and bee hives. The solar roadways don't make sense. Governments may be attracted to them because it is under their control. Even though it would be more efficient, they are not going to pay to put solar on our homes. Likewise, when a solar farm is built it under the control of the electric company. Great story about Bolton Bees, congratulations to Connexus Energy and Minnesota too. One of the positive things about ground mount PV (apart of course from the power they generate) is the ability to continue to use the land for activities like that which benefit the environment. I would have liked to been on the Monticello site or the two this fall that went up between Clear lake and Clear water MN they were 12 to 15 miles from my house. Or the one North of Buffalo MN this fall would have been 8 miles. I did work on one of the two that went up between Winstead and Lester Prairie MN this summer, 28 miles. The solar sites I have worked on were between 30 and 58 acre's in size. I know some of these sites are sponsored by power companies, but so far the ones I worked on were all paid for by investment group's. Gordy, Guess I'll have to defer to a real, if a bit rude, expert. In my case, I started climbing towers and working on Jacobs and other windplants in my pre teens and before the US rural electrification program began more than 70 years ago. I thought I somewhat knew of what I spoke. Guess not. Gordy nice to hear from someone who is current on wind turbines. The only modern one I've ever been close to (50 yards) I could hardly hear. It was a darn site quieter than the traffic even though it was closer. And they're so BIG and slow I can't imagine any healthy bird getting hit, much less a bat. The old farm-size turbines that ran at a blur, maybe. From what you wrote in your first post, I got the distinct impression you were attacking the big wind farms. And I standby what I said. But now I know you were talking about old small mills. With the smaller mills, they are direct drive and need high RPM"s that the smaller blades can deliver and still survive the high RPM's. These small high speed blades can be almost invisible to birds, that and being closer to the ground does lead to some bird strikes. As to the noise. The smaller mills can be louder than the big ones. But the aerodynamics of the blades have changed a lot since the day's of the old Jacob mills, to quiet them down. Some of the windmills I worked on, the center hub's are 275 feet off the ground, and the rotor span is equal to the wing span of a 747 jumbo jet. This summer I was working in a staging yard. We unloaded mill part from trains and loaded them on trucks as needed. Each blade spanned two full flatbed rail cars. There were 3 tower sections, each the same length as the blades. With the nautical and hub shipped separately it took 8 semi's to haul out one complete windmill. Thanks colinmcc. This is one of those issues that keeps repeating in the forums so it's nice to have facts. Do you have a link to that table?